Building a great promotional advertisement means making sure that the headline, copy, and design all work together. Here's how to get it right. Twenty years down the line and hundreds of marketing promotions later, I’m no longer frustrating people so much because I’ve learned to take apart the meat and bones of promotions to better understand how to produce effective ads and literature. But can anyone do it? 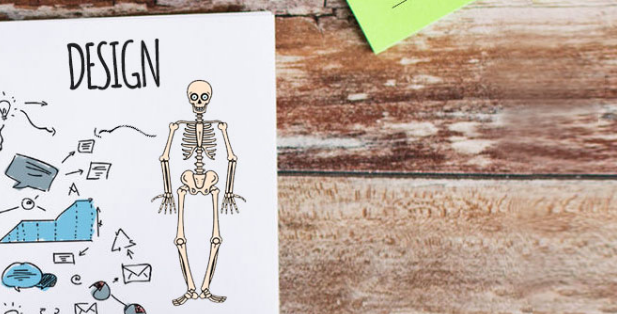 I’m not sure I agree with my old client on that one, but there are certainly some message and design commonalities that can be taken apart and looked at in order to build successful marketing collateral. Whether you’re a rookie designer or a client looking for some sound design and copy advice, this guide can help you understand the anatomy of your promotions and how each one should be built within tried-and-tested parameters. Your headline is a critical part of your promotion. It is the heartbeat that gives it life and meaning. A headline can be as obvious as the word “sale” or simply your product name. It is all about context. Why make it complicated on the cover of a brochure or sell sheet? But then again, why make it super-generic on the headline of a magazine ad that you want to get noticed? A headline can be funny, clever, inspirational, seductive, and so on. But what it can’t be is unrelated to your product and business message. There’s an awful habit that many businesses fall into of trying to lever in puns or well-known phrases—a belief born from reading too many tabloid papers. If you’re able to use clever wordplay to get your point across then that’s great. But trying to “be clever” should never be your motivation for writing a headline. In my opinion, this headline for Kenneth Cole shoes (above) leaves the viewer wondering: What’s being sold here? What point is being made? How can this information be acted upon? In view of the fact that this ad was also trying to somewhat make a social statement, it just seems like the wrong place for a “pun” and the whole thing results in a confusing statement with forced humor. At first glance, this headline (above) could be viewed as fairly unremarkable. However, this headline for Metro Shoes is doing its job because it’s clearly defining a message and a purpose for this piece of promotional literature. 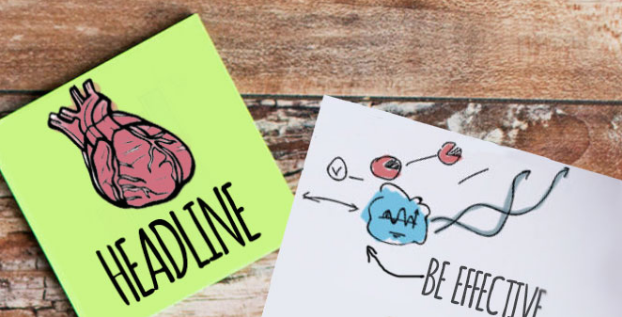 Here are just a few examples of headline strategies that you can adopt for your own business. Be smart about writing your body copy. 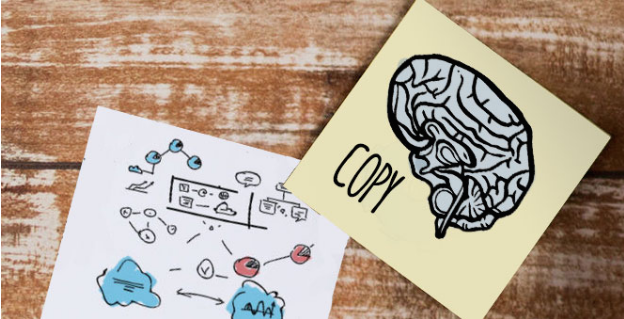 Whether you’re writing a paragraph for an ad or an entire brochure, the body copy should reflect your business’s brain and voice. Don’t just cut and paste a copy style; know who you are and who you’re talking to. If you’re advertising a tech business, you need to sound informed and intelligent; however, if you own an events business, sounding “techy” rather than fun and upbeat is clearly the wrong approach. Describe the benefits customers get from your business as soon as possible. The benefit is really what customers are after; is it cheaper, is it faster, is it newer, will it make my hair grow back? Don’t write in long paragraphs. 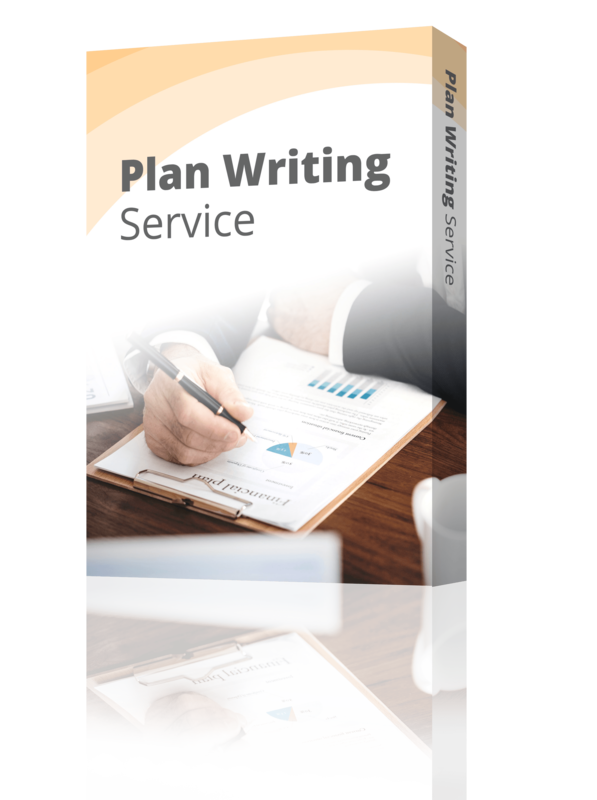 Make your paragraphs short and sweet and make sure each paragraph has a subheading to help organize your copy into an easy-to-follow story. When people read your promotion, the subheadings should give a great summary of what you’re offering without the need to read each paragraph. Don’t be afraid of bullets or itemized info. Summarized lists of features and highlights are a quick and effective way of drawing attention to major benefits while giving the viewer easily digestible information. If you can put a complex piece of info in a simple data graph or graphic, then do so. A picture can say more in one second than an entire paragraph or even page of copy. Don’t ever forget what you want people to do with the promotion you’re offering. Getting customers to do what you want is a bit like herding cats! People have short attention spans and getting them to see your phone number, redeem your coupon, link to your web address, or visit your store is far more important than getting them to read any of your body copy. Like free prizes? Like us on Facebook! The design of your promotion is not only what makes it attractive, it’s also what helps the viewer make sense of the information you’re presenting. It’s the meat of your literature that fills out the bare bones of an idea. Harmonize your promotion to include both images and copy. Think of your images and copy running down the beach, hand-in-hand together! They are supposed to be a team that works in unison. Breakdown of company promotion that illustrates how each component is presented clearly to the viewer, with each design element working harmoniously. If you’ve never heard of this term, the rule of threes is a great composition guide to consider for every page of literature you produce. It’s a great rule to follow that allows you to design in a way that naturally conforms to the way a viewer sees and follows visual information. By splitting your page into three vertical or horizontal sections, you can create a layout that has natural structure and eye-flow. 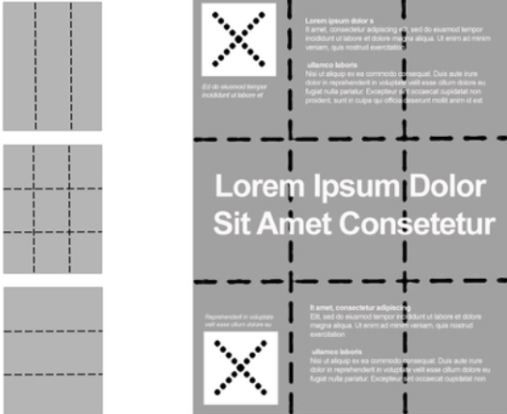 Various rule of three layouts that include a completed wireframe with a headline, copy, and images laid out within the three block grid pattern. 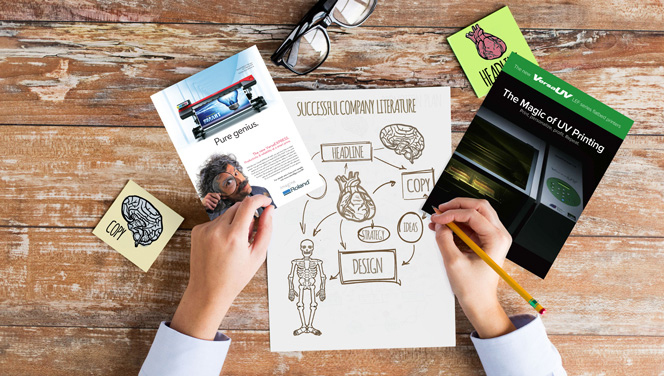 Every promotion is different, but whether it’s a brochure, sell sheet, flyer, or advertisement, it needs to have a powerful structure and a strong message to effectively support your business. Ben Fellowes is Sr. Copywriter and marketing expert at Roland DGA. He has designed and produced content for some of the world’s top agencies and marketing companies. He's currently working (and getting his fair English skin burned) in Southern California! He loves art, punk rock, horror films, comic books, real beer, cooking, and eating too much!